When Ann Voskamp was 5 years old, her younger sister Aimee was hit by a delivery truck in front of their farm house. Aimee was chasing a cat and ran out into the road. The driver said he never saw her in the road. Her mother witnessed the accident. Ann has vivid memories of her mother sitting on the front porch rocking her little sister while the blood seeped through the quilt she was wrapped in. 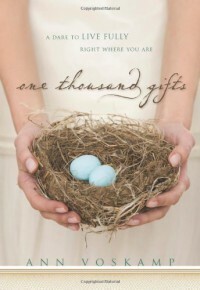 The description of the accident that caused Aimee's death begins the book "One Thousand Gifts".Ann becomes a Christian when she is 16, but is haunted by her continued grief and inability to get past the death of her sister. Images of blood soaking through quilts appear frequently. This one event in her life has scarred her family forever. Her father stopped going to church after Aimee died. Her mother was in and out of psychiatric hospitals for years. Ann herself even seems to have struggled with cutting herself. Ann eventually marries a farmer in Canada, settles down to being a farmer's wife, and rears 6 children. Through it all, Ann struggles with wanting to live a full Christian life, not full of anger or bitterness, not focused always on the evil and wickedness in life. Her son Levi has an accident in the barn and needs surgery on his hand. While taking him to the hospital, Ann hears of a young Mennonite farmer boy who was killed in an accident on the farm. Ann also remembers the tragic illness and death of two of her nephews from an unusual genetic disease. She marvels that her brother-in-law accepts the grief and still praises God for having had the boys at all. Sorrow, death, tragedy surround all things. How do you live in the middle of this? Ann comes up with a practice to change her heart from being angry and bitter and to focus her thoughts on being thankful to the Lord. She focuses on "eucharisteo", thanksgiving to God. She begins making a list of "1000 things that she loves" and thanking God for them. She keeps a journal and writes down any and every item that she sees that she loves. Entries are written much like William Carlos William poems. "Morning shadows across the old floors". "Jam piled high on the toast". "Cry of blue jay from high in the spruce". "Laundry flapping". "Click of a seat belt". "Book pages turning". "Boys humming hymns". The practice of being thankful for these things listed heals her heart and softens her life. Being thankful literally changes her life, and allows her to live with joy. By the end of the book she is able to go to Aimee's gravestone and be thankful for her sister, even though she doesn't understand why Aimee died.I applaud Ann for being a farmer's wife, Lord knows we need more of them. I also applaud Ann for her 6 children, who are blessings to her at all times in the book. 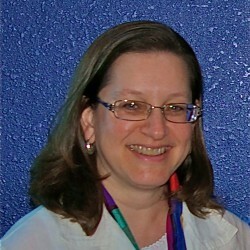 I am also happy that she homeschools her children, what a great education for all involved. However, I have to admit this book made me tired. Ann's style of writing is very poetic. She invents new word phrases to capture special nuances, and to me it makes the sentences stumble. It jars and does not read well either silently or aloud. I found myself scanning to the next paragraph hoping to get back to something concrete instead of wading through prose trying to be poetry. I agree totally with Ann's habit of thanksgiving to the Lord. I agree that being thankful to Jesus for small things helps heal the horrific slashes and cuts of wickedness and evil in the world. But at the end of the book, I am left wondering, "what happened to Ann's mother?". If Ann's practice of thanksgiving helped her, I wonder if it helped her mother?